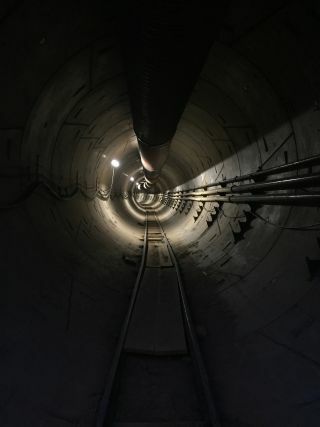 Elon Musk's company, The Boring Co., has received preliminary approval to begin digging an underground Hyperloop tunnel beneath Washington, D.C. The Washington, D.C., Department of Transportation issued a permit to Musk's company to start digging underneath an abandoned parking lot near the Bureau of Alcohol, Tobacco and Firearms, The Washington Post reported. It's still not clear how extensive the digging will be or what types of work the permit will allow, The Post reported. The now-abandoned parking lot could one day become a Hyperloop station, where people would get on and off futuristic pods that speed through a tunnel on a cushion of air. Musk initially said he received verbal approval for an East Coast tunnel digging project last summer on Twitter. The proposed East Coast route would connect New York, Philadelphia, Baltimore and Washington, D.C., in less than a half-hour. The Washington, D.C., project is just one of many Hyperloop projects being developed. A Hyperloop test track is being built and developed in the desert just outside of Las Vegas, while a team of students in Germany recently won a competition to design the Hyperloop pods.